The Hooded Man's name has been revealed, and some of the plot behind the Devourer's appearance in the Heretic Kingdoms is lain bare. Now the Devourer and his Puppet(s) must escape from Thole, and the only way to do it is to go through the Catacombs beneath the city. What strange undead await our antiheroes...? 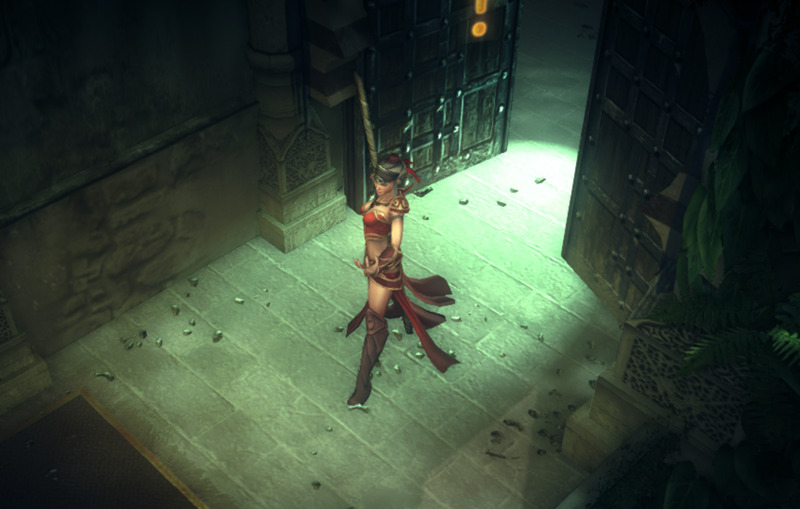 - Once you've acquired the Arcanum Key and visited Krenz in the Arcanum, it's time to escape Thole. The city is currently under siege, leaving you with only one option: flee through the Lower Catacombs. You can access them via the Burial Ground, in the far west of Thole. - If you've been doing side quests you've probably been here before. Otherwise, welcome! Populated by a bunch of familiar meanies, the Burial Ground is your standard dungeon. Tread lightly. Your primary concern here will be not getting stopped up by the webs laid down by Aphotic Spiders, as they'll allow the otherwise-slow Mummified Guards in the area to creep up and smack you down. - Dead ahead is a bridge that's out. Turn into the Devourer to cross. You'll encounter enemies on both sides of the world ahead. Feel free to look through the coffins and urns littering the area. - The path now splits to the west and to the east, as well as continuing on to the north. West and east will lead you to potential riches and more experience from monsters, but neither the Devourer or his Puppets will find a whole lot of use. Head north. - If you want to make short work of Burial Ground, head straight north as the Devourer. There's an incomplete set of stairs directly ahead that the Devourer can float right up. The Puppets will have to take a slightly longer side route. Your destination is in the northeast corner of the next area, along a branching pathway of thin bridges and down in a pit. Explore the side rooms as you wish (there are plenty of containers to bust open, and potentially some great items if you get lucky), then head for the waypoint. - ... a cut scene! If you're playing as Jasker, anyway. When it's done you'll receive a new quest, Find Kiri Malfagon. You'll get to it soon enough. For now, down. - A new area! Weeeee! 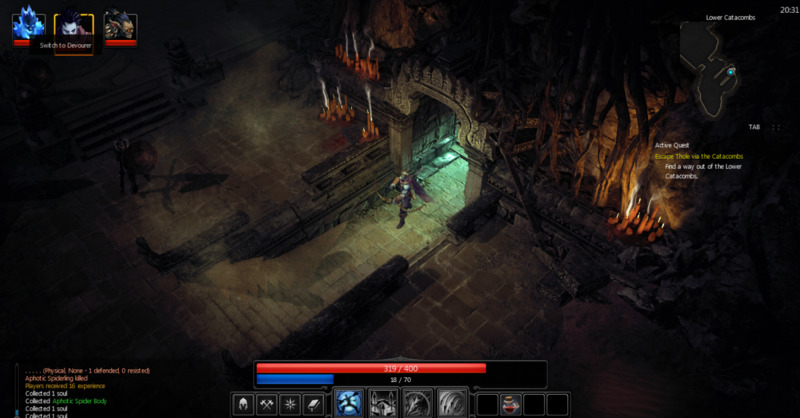 The Lower Catacombs are populated by Mummies, slow-moving but powerful melee combatants. Ranged fighters will find it easier to fight down here, as they can simply step away from the Mummies and fire at a distance. AOE attacks are great if you can clump your opponents up into a tight ball, which is quite easy under the circumstances. The Mummified Archers are the obvious exception to these rules, and should be engaged at close range when possible. - Be very careful when switching between worlds here. This is true of most places, of course, but there are large groups of Mummies down here that can quickly gang up and destroy you if you change from Devourer to Puppet in the wrong places. 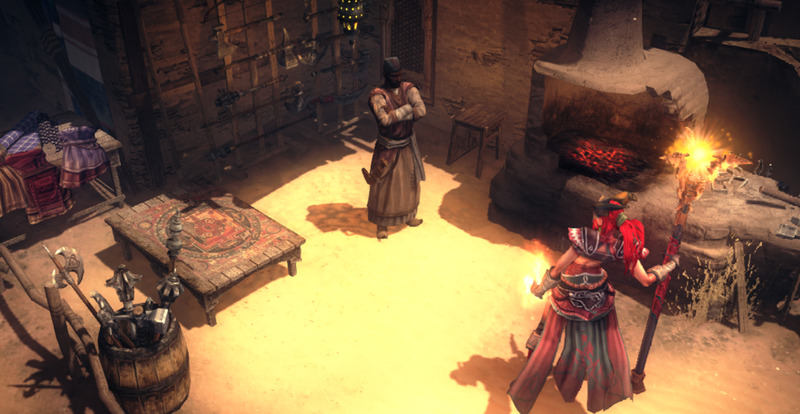 At the very least make changes near the edge of rooms, so you have a chance to react to nearby enemies. - Head north from the entrance. There are two Mummies straight ahead upon which you can cut your teeth, and in the next large chamber there's a larger group. Take out the Archers first, if you can. - Dead ahead is a magic barrier. You can't go through it. You'll have to take one of the paths to your left or right. Both are necessary to proceed. Start with the right. If you take the right path as a Puppet you won't find a whole lot on the other side, save some Mummy guardians and a coffin. Revert to the Devourer, however, and you'll discover the Guardian, an imposing, unique spirit with a lot of defenders and some powerful moves in its own right. Face off against these foes unprepared (particularly if you change worlds beside the coffin) and you'll just get yourself killed. First, deal with the bridge leading to the Guardian. There are two Phantom Spirits on it that can really put a damper on any escape attempts. You want them gone. For this reason you should become the Devourer before you even attempt to cross the bridge. That done, lure the Guardian. At first glance the thing is on its own, but if you approach the coffin a slew of fellow demons will join it. Bring it safely out on the bridge by staying put when you aggro the fiend. Then engage it out here. Keep your health high with souls, and if you have it, use Soulrush to occasionally stun the Guardian. Keep pummelling until it goes down. It will drop a Red Guard Lich Essence upon defeat. - One down. You can cross the broken bridge south of the coffin via the Devourer, if you wish, though all you'll find are two Mummified Archers and a rusted, locked door. Return to the central platform. Now for the left path. - To the west you'll find several traps. Weave between them in your Devourer form. At the end you'll find... another Guardian! This one's basically the same as the other, though it gets less reinforcements and can be engaged safely wherever you like. You can also jump to your Puppets, and, assuming you have a ranged attack, you can shoot it from a distance quite safely (though you'll have to switch to the Devourer to pick up its leavings). This Guardian drops a Blue Guard Lich Essence. Check the coffin near it for Advanced Gateweaving. - Head for the magic barrier. With the two essences in hand it will pop right open and let you through. Follow the path beyond as the Devourer, minding the Dimensional Rift that pops up halfway across. - Up the next set of stairs, assuming you're now travelling as a Puppet, a pair of Mummified Warriors will jump out of the wall on your right. Be ready to fight. To the left of their ambush point is a Cenotaph for your healing purposes. - Continue northward. The path splits, though the gate in the west is locked. Go east instead. The resistance at the crossroads is stiff in both dimensions, though the Puppets have it a bit harder when facing off against Mummies and Spiders simultaneously. - At the top of the stairs in the east you'll find a heated floor, and beside it a lever. Pull the lever to deactivate the heat on some of the panels. Now you have to cross the trap floor by stepping on the correct panels. Step on the wrong one and you'll get hurt, resetting the trap immediately and forcing a restart. 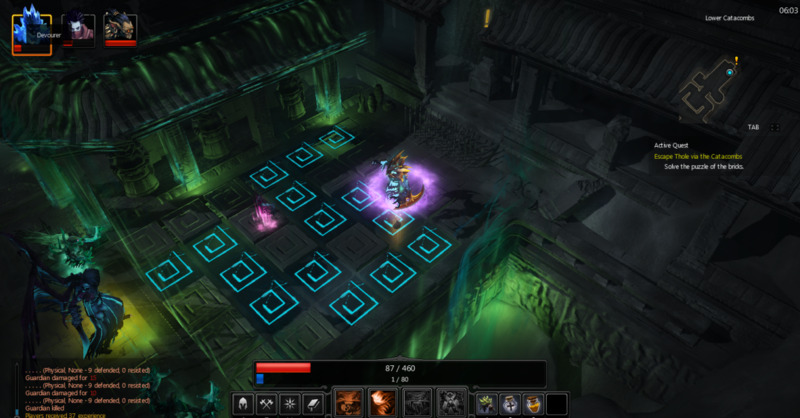 The path is laid out on the Devourer's side in blue tiles; all you have to do is memorize it and follow the same path as a Puppet. (Or look at the picture above.) Make sure you click slowly along the tiles; otherwise your Puppet is likely to fly across the wrong tile and get hurt. 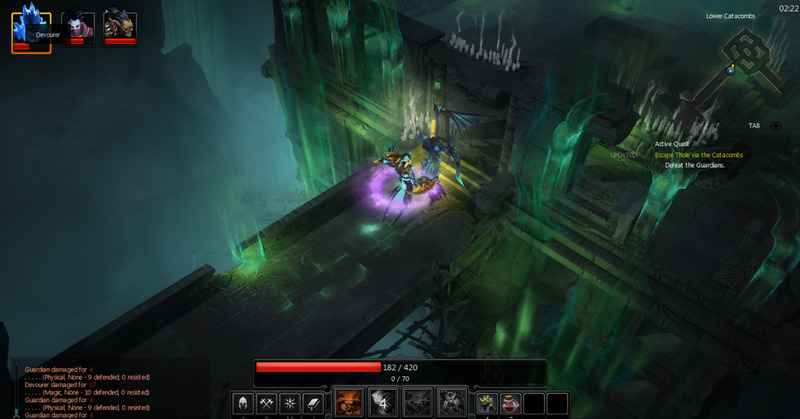 - Getting across successfully will lower the spikes in front of the chest at the end of the trap. Inside, along with assorted other swag, is an Engraved Key. Grab it. - Return to the Cenotaph to heal up, then save and head west. You can now pop open the door, clearing the way out of here... or so you might think. First, boss! A tough battle, but not as difficult as it first seems. Darmok is a mage, and he'll spend the fight teleporting around the room, launching fireballs at you and occasionally zapping you from above with a green light. The arena is lined with fire traps that go off at predictable intervals, and the chances are pretty good you'll run over at least one while chasing Darmok around. All this isn't the problem. The first, and the simplest, is to change to the Devourer. It doesn't appear when you're the Devourer. This is the preferred method if you lack stunning moves or, at the very least, a ranged weapon. The second is to never engage the Ironclad Zombie directly. Run around the arena and shoot the thing from afar, preferably nowhere near Darmok himself. The Ironclad Zombie has ridiculous amounts of HP, but it can be easily whittled down by luring it into - and stunning it on! - the fire traps. Stunlock it and it'll take a decent chunk of damage when the trap goes off. You can deal even more damage by luring it into Darmok's AOE timelapse spells, but this is a fair bit harder to do. Killing the Ironclad Zombie will net you a nice assortment of restorative swag and equipment. Once you've dealt with the Zombie, one way or another, you have to off Darmok. He's not that bad, really, as his fireballs are slow and his teleportation seldom takes him very far. Stun him and smack away at his health. Assuming you got rid of the Zombie you can swap between the Devourer and your Puppets to whittle away at his health in equal amounts. It'll take a while, but overall? Not too bad. - Beating Darmok will earn you the Ironclad Zombie as a playable party member! Woo! It will drop the Rusty Iron Fists and the Rusty Iron Carapace, both of which you should equip on the thing post-haste. It's... pretty weak without its gear. Darmok will drop the Heartseeker, a very fancy bow, Darmok's Staff for Evia, and the Golden Ceremonial Suit. - Head up the stairs Darmok was protecting. At the top, in both dimensions, you'll find another large group of enemies. Yay! This is a good opportunity to try out the brutal Ironclad Zombie and mash up everything in your path. - At the top of the stairs you'll find the Skull Gate. Use the Ironclad Zombie to smash through the Gate and you'll be on your way to the second chapter. Huzzah! Hey guys how are you?, who knows how to get the Chest full of treasures in Outlands? Did you get the Chest full of treasures at Outlands? In the Nomad camp up north? @MattWritesStuff Dude did you do the quest of the Blind demon? Ah, cool. 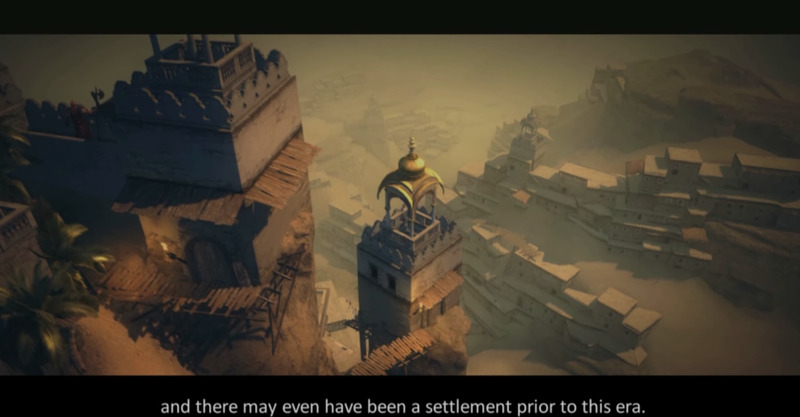 I haven't spoken to Arashad since going through there to the Nomad Camp, so no wonder I missed it. Thanks. Once I'm done with another game I'll come back and give your advice a go. After I got stuck at the skull gate I've just been wandering around for awhile so that's how I discovered my previous statement. If you didn't understand, the door with the room with the dead rouge in the lower catacombs can be opened by receiving a quest given by Arashad. You will ask the question " do you need anything from the catacombs" and he will tell you about a tablet lost their, and will give you a key. PS: I figured this out when I used the character Evia, so I don't know if it works the same if you picked someone else. Also I completed every other side-quest, so I also don't know if that will affect anything. If yhou want to get through the rusty door I figured it out. 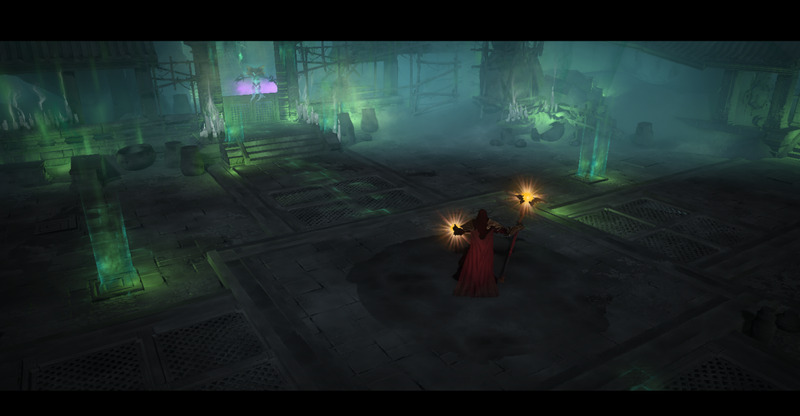 If you go back to arashad once you have already gone into the lower catacombs he will have a new quest for you, and he will give you an old key to the door there. Yeah i did same thing with Skull gate, broke it , then saved game to continue later, and it wasn't passable any more, luckily i had previous save , so i reverted.But you might wanna go and ask Dev's for fix.It might be a while tho. I don't know about the locked door, to be honest. I've tried to get through it a few times with no luck. I assume you come back later in the game...? not sure yet. Also couldn't tell you about the Skull Gate. Might want to bring it up with the developers on Steam. They seem like pretty helpful people. How do you open the locked door in southeast corner (one with dead rogue on ground in it)? I'll let the comment through, but I disagree. I think it's a lot of fun, personally. I'm looking forward to finishing it when my schedule clears up a little. And I don't find the controls that bad at all, though I'll admit the characters sometimes wander in the wrong direction. The results are hardly disastrous when this happens. Game is just no good, boring, no open world, controls are not working how it need to work, shift + q,w,e,r don't work. Just need polish at last for controls then for character movement what is sometimes confused. If u accidentally install game my suggestions is uninstall and forget it. I was quite impressed. A few bugs set me back during play, but that's what happens when you play a work-in-progress. The switching mechanic is really fun. I look forward to plowing through the rest of the story. Playing as a magic user is definitely on the to-do list. I'm impressed! You put a lot of efforts into this :D It was fun reading through it. What's your verdict at the end of chapter 1? Are you excited to see other regions and play other characters?